Rowland Langmaid (1897-1956). 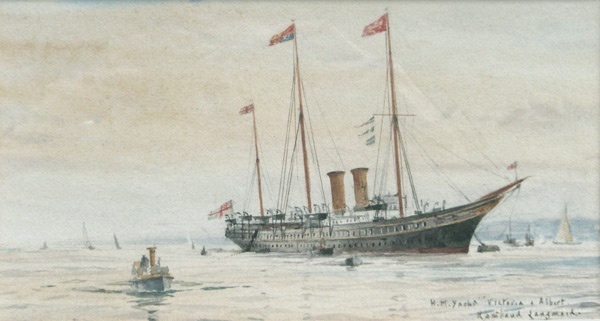 Watercolour signed and annotated HM Yacht Victoria & Albert (LR). size: 7.5 x 4 ins (19 x 10 cms ) approx. A familiar sight to those who knew the Solent in the first three and a half decades of the twentieth century, HM Yacht VICTORIA & ALBERT is painted here wearing Court Flags and with the starboard aft ladder down: the King was in residence, very likely sailing his beloved BRITANNIA! Although the Royal Yacht would normally secure to a buoy some 8 cables (1600 yards) off the Royal Yacht Squadron’s castle at Cowes on the Isle of Wight, something about the background painted here by Langmaid suggests we are further east along the coast, closer to Ryde perhaps? In any event V&A is surrounded by the usual flurry of boats - some official such as the steam pinnace in the foreground and the two Service cutters pulling away from the Yacht, others who are either racing, pottering about or busy on their lawful business in one trade or another. Both King Edward VII (1901-1910) and King George V (1910-1935) had served in the Royal Navy and had a close affinity, we are told, with the sea; and both loved sailing and racing BRITANNIA. Holding the position in their respective day of Admiral of the Royal Yacht Squadron, both were frequent visitors to the Squadron’s beautifully appointed headquarters, the Castle; and when they were present Their Majesties brought, of course, an added lustre to the Squadron and its manicured lawns. By day they would be out in the Solent aboard BRITANNIA doing battle with their competitors; or perhaps would be found on the Platform at the Squadron from where they could command an excellent view of others racing. Tea would often be taken on the lawn before they returned to the Yacht to change into Squadron mess kit. And then in the evenings they would usually land from the Yacht for dinner in the Members’ dining room at the Squadron; when it was time turn in for the night the Yacht would send in the Royal barge to collect the Royal party. Embarkation on and off the barge at the Royal Yacht Squadron was via Suicide steps, so christened by generations of Royal Barge Officers - young Sub Lieutenants/Lieutenants - who risked their very careers to keep their passengers dry shod! The King's Cox'n of the magnificently burnished barge would finely judge his manoeuvres to get delicately alongside the unyielding stone steps which always seemed to be cross swept by a viciously ebbing or flooding tide! Indeed, it took until this present century for an enclosing breakwater arm to be built by the Squadron and for the sluicing tides to be tamed and Suicide steps to lose its terrors!